Graduates of LouAnne's are considered leaders in the Space Hostess field, and are assured their choice of the placements they qualify for, including the prestigious São Paulo-Marsport run. This pattern courtesy of Sheila at Out of the Ashes, who is offering an extra 15% off through the end of today (Monday the 15th). LOL This dress/jumper does have that stewardess look to it. And that HAT! It just screams, Come Fly With Me! Really, Lois, of all the accesories Tim lets us have from the Bluefly.com wall, and you picked that hat! Interesting how in Approved Pose #2 the right arm disappears…! Can you get tuition assistance for Lou Anns? Rolling on the floor! Thank you SO MUCH for this hilarious tidbit. LOVE, LOVE, LOVE it! The stiff blue version just makes me ITCH, it screams polyester so loud. Those outfits would be so unflattering on anyone with curves. Oh, what a sweet pattern! I always enjoy these, but this one made me laugh out loud. I think its the oops! hand-to-mouth on poor Darla. Funny! I wish I had your talent for coming up with clever descriptions for some of these rather bizarre outfits. Poor choice of fabric and trim, but the dress itself has potential. Id maybe do it in burgundy, and lose the ruffle. Nobody needs a ruffle at crotch level. I think Id do a strip of flat bias trim. LOL. Even though it looks a bit like a walking cafe curtain, it is cute and I would totally wear it. Ah, home-ec teachers! My home-ec teacher neglected to tell one of my classmates about one way fabric before she started cutting out. At our class fashion show the poor child wore a dress made out of toile with a huge French chateau right-side up on the front, and upside-down on the back. I was appalled. You did it again. So funny. Love the others comments, too. This is a very strange design. As much as I love aprons, why would one deliberately wear this one? Hooray! Ive missed your stories! Love em! you are one funny person. these make my day. Uh-huh, looks like Darla was already partaking of the coffee pot with that oops expression hand-to-face. A little wind to inflate that apron sail? LOVE the post! 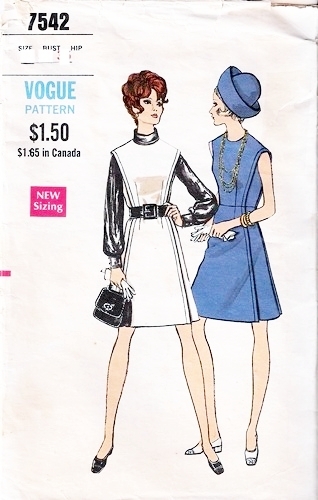 Love those vintage patterns! Thanks for sharing.